A lot of people are talking about the parity in Division I boys basketball right now. Well guess what folks, it's the same thing in D-II! Before the season everyone (including yours truly) was saying it was Portsmouth and Pembroke who were the clear cut favorites. Well Portsmouth has lost 2 of its last 3 games, and Pembroke just lost to Hanover in a rout last night 66-47. Nobody was talking about Hanover or Souhegan before the season, but right now they are playing as well as anyone in the division. On Wednesday night, while the girls teams of the 2 schools were playing up in Lebanon in a rematch of last year's D-II title game, the Souhegan boys team put their impressive 8-1 record on the line in Amherst against a very good Lebanon team. Lebanon was still licking their wounds, as they recently found out senior big man Alexander Morrill is sitting the rest of the season while rehabbing a foot injury so he could play football at UNH next year. Not only that but they were coming into this game after losing 51-37 to that aforementioned Hanover team on Saturday. 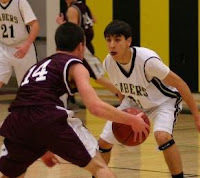 Souhegan took advantage, and led by junior point guard Brandon Len and his 20 points, 7 assists and 3 steals they came away with a 58-49 win to improve to 9-1 on the season. "It's a credit to the way we practiced" said Len, who has really stepped up his game this season after the team lost its 2 best players from last year to graduation (Seth Cordts) and to prep school (Devin Gilligan). "We're a pretty good drive-and-kick team. We moved the ball well against their zone and got shots inside. Once we got them to come out of their zone we were okay." Lebanon came out in a 2-3 zone and stayed in it for most of the game. But Souhegan executed very well against it. They always had one of their bigs at the foul line, and he was always open. They'd get the ball to the foul line, kick it back out, move the ball inside and out and let Len do his thing and create offense. "We usually don't play zone actually" said Lebanon head coach Keith Matte. "But we did it to try and stop their inside game, but they still scored inside. I like the fact that our kids battled hard all game, though. Matt Cowles had one of his better games for us with 15 points and 12 rebounds." This game was closer than the final score would indicate. Lebanon was only down 10-8 after 1 quarter, and after a nice offensive rebound and and-1 finish by Cowles they were only down 13-12. But from there Souhegan went on a 6-0 run, with all 3 of the buckets in that run coming on layups (by Len, Sean McGrath and Ben Peterson). From there the Sabers were able to maintain a lead of between 6 - 9 points for the majority of the game. Lebanon came on strong in the 2nd half though as they made a couple of different comeback attempts that Souhegan was able to hold off. In the 3rd quarter Tyler Silver hit an 18-footer followed by a strong drive to the basket and and-1 finish by senior forward Mark Davidson (17 points and 7 rebounds). That cut the Sabers lead to 39-34 with 2:28 left in the 3rd quarter. But then Souhegan answered right back. Len made a great hustle play to dive out of bounds to save the ball for his team which led to a basket, then Tyler Ford made a nice drive and finish inside with just 3 seconds left in the 3rd quarter. Lebanon was down 43-34 heading to the 4th. Then came the next Raiders comeback bid, as they came out playing hard to begin the 4th quarter. Davidson made another strong and-1 finish inside, followed by a three-pointer by David Hampton (10 points). He had a hand right in his face but still hit the shot, and just like that Lebanon had cut the lead to 43-40 with still 6:20 left to play. But once again, Souhegan was able to hold off the run. Lebanon's shots stopped falling and senior wing player Shaun McKenna had a couple of big buckets late in the game. Davidson and Cowles both made plays late to try and keep the Raiders in it but it wasn't enough. Len played tough defense and did a great job of controlling the tempo on offense. he also hit some clutch free throws down the stretch. A few free throws late in the game with Lebanon trying to desperately foul them to stop the clock allowed the Sabers to push the game out of reach and win it 58-49. The bottom line is this was a half court game and Souhegan did a better job of executing their half court offense. "Turnovers hurt us" lamented Coach Matte, whose team is now 5-5 on the season. "We turned the ball over 8 times in the first few minutes and they went up 10-3. We need to have better composure." It was a much different story for Souhegan, as they did a great job of picking apart the Lebanon zone. Len did a great job at the point, setting his teammates up for looks but also knowing when to look for his own offense. Zach Simmonds (9 of his 11 points came in 2nd half) hit some big shots for them as well, and Peterson, McGrath, McKenna and Tim Beliveau all gave the the Sabers strong play inside. "Forget their record, Lebanon is a really good team" said Souhegan head coach Mike Heaney. "But I was proud of our guys, because finished a game off against a good team. I thought we executed well on offense. We didn't settle for outside shots and we went inside-outside really well which was effective against their zone." Over the last 2 days Hanover (now 9-0) and Souhegan (now 9-1) have both had BIG wins in D-II, with Hanover's win over Pembroke last night and Souhegan defeating Lebanon tonight. Neither team was ranked very highly in the preseason but they are both legitimate title contenders. "We saw in the preseason we ranked 9th here and we were ranked 10th here and it motivated us" said Coach Heaney. "We probably graduated more talent off last year's team than anyone in our division except Milford. And then Devin went to prep school. So I'm sure that's why we were ranked lower. But then before the season we were looking around at each other and felt like we still had a pretty good team." For the record, I was wrong about both Hanover and Souhegan - they're both for real. It doesn't get any easier for either of these teams, as Souhegan takes on their biggest rival Milford on Friday night while Lebanon plays host to a good Coe-Brown team.